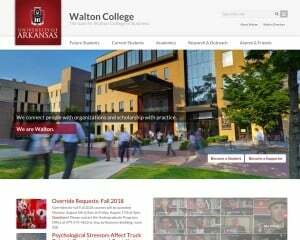 How does the Sam M. Walton College of Business MBA program at University of Arkansas compare to other MBA programs in Arkansas, or to online MBA programs and programs in the United States for tuition, GMAT scores, enrollment, student population, rankings, concentrations offered, alumni strength, and more? In-state tuition and fees for the MBA program at Sam M. Walton College of Business is $29,186 a year. Of all MBA programs offered in Arkansas, the average cost for in-state tuition and fees is $17,453 a year. The average cost for in-state tuition and fees for an online MBA program is $34,054 a year. The average GMAT score to enter into Sam M. Walton College of Business is 589.7 while the average GMAT score to for MBA schools in Arkansas is 511.05, and the average GMAT score to enter into an online GMAT program is 538.33. MBA Concentrations offered from University of Arkansas's Sam M. Walton College of Business include Accounting, Economics, Entrepreneurship, Finance, Information Systems, Marketing, Supply Chain and you can attend an MBA program offered as Full-Time, Part-Time. Concentrations from Arkansas's other MBA programs include General Business, Accounting, Information Systems, Economics, Entrepreneurship, Finance, Management, Marketing, Supply Chain. Dig deeper into accredited MBA business school numbers for tuition, faculty, GMAT scores, student population, MBA rankings, and more. Explore in-depth details about Arkansas's 9 MBA programs, compare Arkansas's MBA programs to the 173 Online MBA Programs, and to accredited MBA program available nationwide.